“This is happiness,” Willa Cather’s fictional narrator gasps as he sinks into his grandmother’s garden, “to be dissolved into something complete and great.” A generation later, in a real-life counterpart, Virginia Woolf arrived at the greatest epiphany of her life — and to this day perhaps the finest definition of what it takes to be an artist — while contemplating the completeness and greatness abloom in the garden. Nearly a century later, botanist and nature writer Robin Wall Kimmerer, who has written beautifully about the art of attentiveness to life at all scales, examines the revelations of the garden in Braiding Sweetgrass: Indigenous Wisdom, Scientific Knowledge and the Teachings of Plants (public library) — an unusual and richly rewarding book blending botany, Native American mythology, natural history, and philosophy. They complain about garden chores, as kids are supposed to do, but once they start they get caught up in the softness of the dirt and the smell of the day and it is hours later when they come back into the house. Seeds for this basket of beans were poked into the ground by their fingers back in May. Seeing them plant and harvest makes me feel like a good mother, teaching them how to provide for themselves. How do I show my girls I love them on a morning in June? I pick them wild strawberries. On a February afternoon we build snowmen and then sit by the fire. In March we make maple syrup. We pick violets in May and go swimming in July. On an August night we lay out blankets and watch meteor showers. In November, that great teacher the woodpile comes into our lives. That’s just the beginning. How do we show our children our love? Each in our own way by a shower of gifts and a heavy rain of lessons. Maybe it was the smell of ripe tomatoes, or the oriole singing, or that certain slant of light on a yellow afternoon and the beans hanging thick around me. It just came to me in a wash of happiness that made me laugh out loud, startling the chickadees who were picking at the sunflowers, raining black and white hulls on the ground. I knew it with a certainty as warm and clear as the September sunshine. The land loves us back. She loves us with beans and tomatoes, with roasting ears and blackberries and birdsongs. By a shower of gifts and a heavy rain of lessons. She provides for us and teaches us to provide for ourselves. That’s what good mothers do. [The] kind of deep attention that we pay as children is something that I cherish, that I think we all can cherish and reclaim — because attention is the doorway to gratitude, the doorway to wonder, the doorway to reciprocity. And it worries me greatly that today’s children can recognize 100 corporate logos and fewer than 10 plants. That means they’re not paying attention. 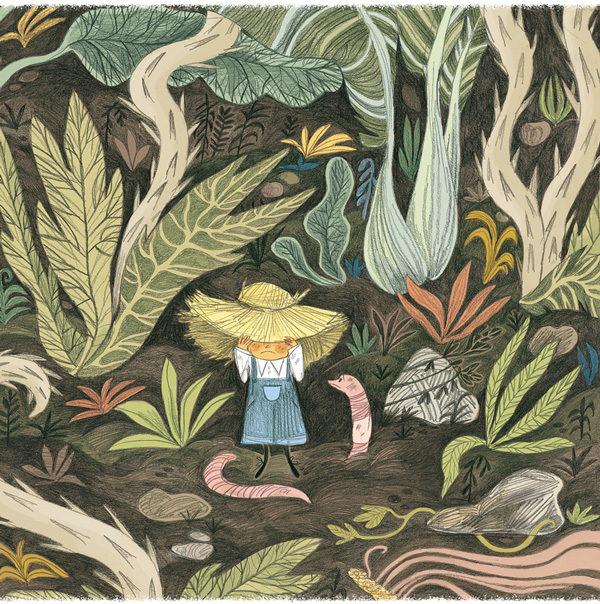 Complement with Mary Oliver — another patron saint of listening and of the Earth — on what it really means to pay attention, then revisit Kimmerer’s exquisite writings about the magic of moss and how naming confers dignity upon existence.